Made-to-order hand knit thumbless mittens for babies in your choice of color. No thumb design allows the mittens to easily slip onto tiny hands. 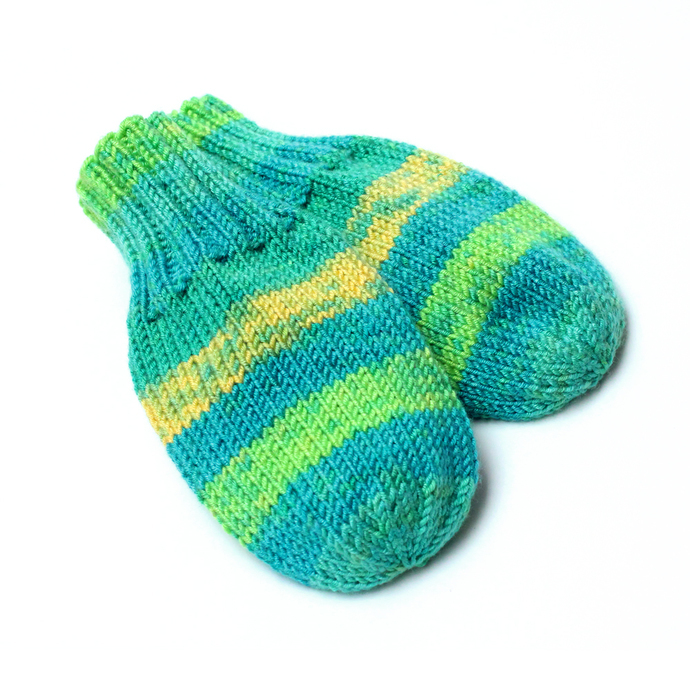 Left and right mitts are interchangeable â they fit either hand. Mittens are available in two styles: cordless and corded. If baby does manage to wiggle out of the mittens, a coat cord will help prevent them from being lost. If you want a coat cord, select the "Corded" style. Twenty wool-free yarn (20) colors are available. 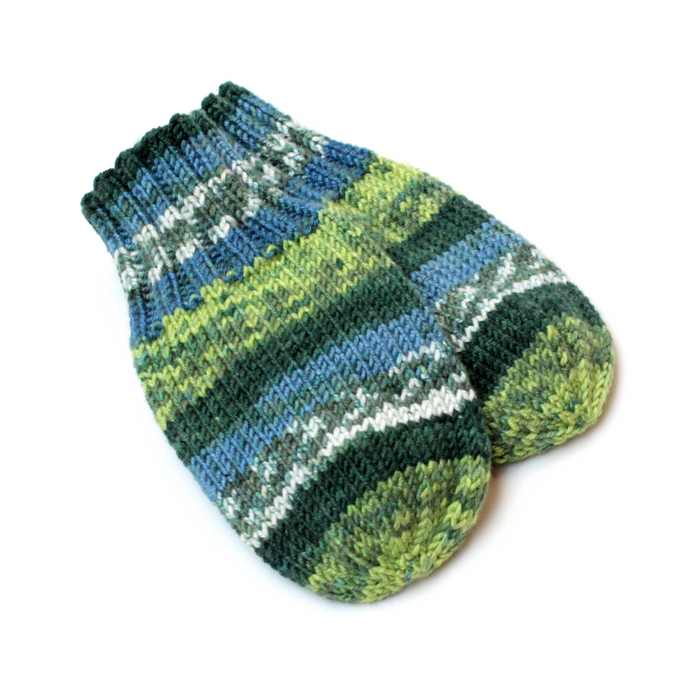 Please note that these mittens are knitted with self-patterning yarn. 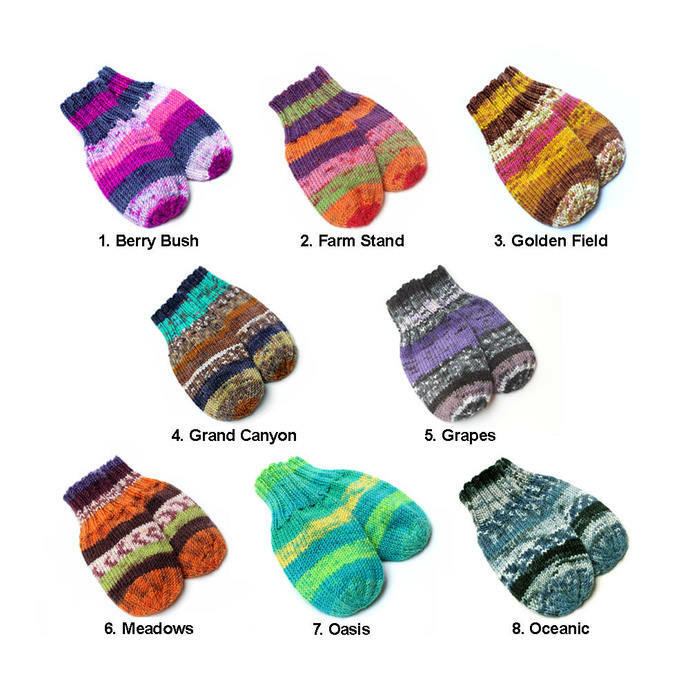 Each pair of mittens will be unique and the stripe placement will vary from size to size and may not be exactly the same from pair to pair. Please allow for artistic license. These traditionally styled mittens are knit in-the-round with superfine weight yarn on US size 1 (2.25 mm diameter) double-pointed needles (not cranked on a machine â see the photo of work in progress). 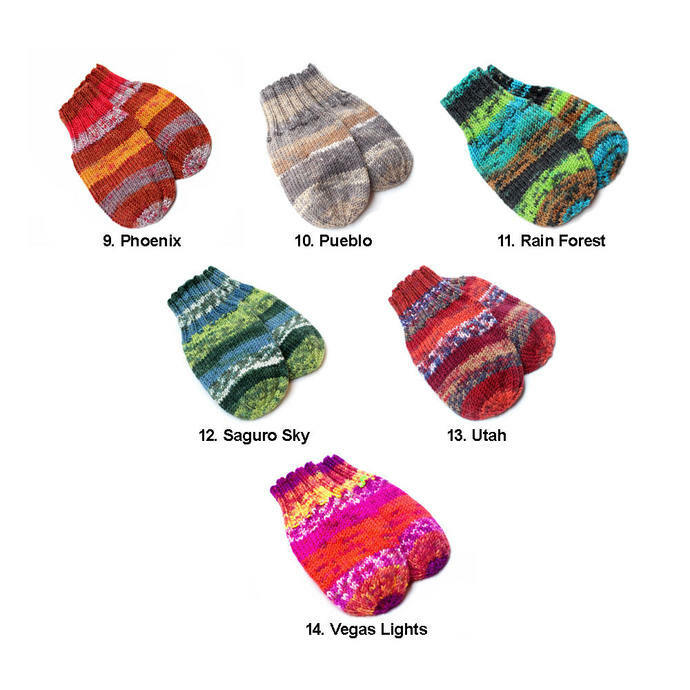 The fine, tight gauge increases the warmth and durability of the knit fabric. 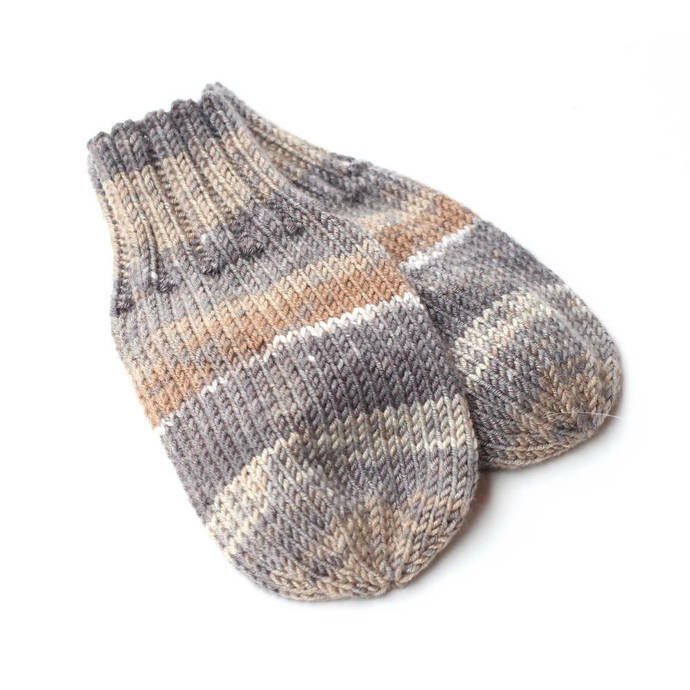 These lightweight synthetic blend mittens are hand knit in smooth stockinette stitch with classic shaping and seamless construction with no rough edges inside the mitten. Ribbed cuffs gently hug the wrist to help prevent them from falling off. 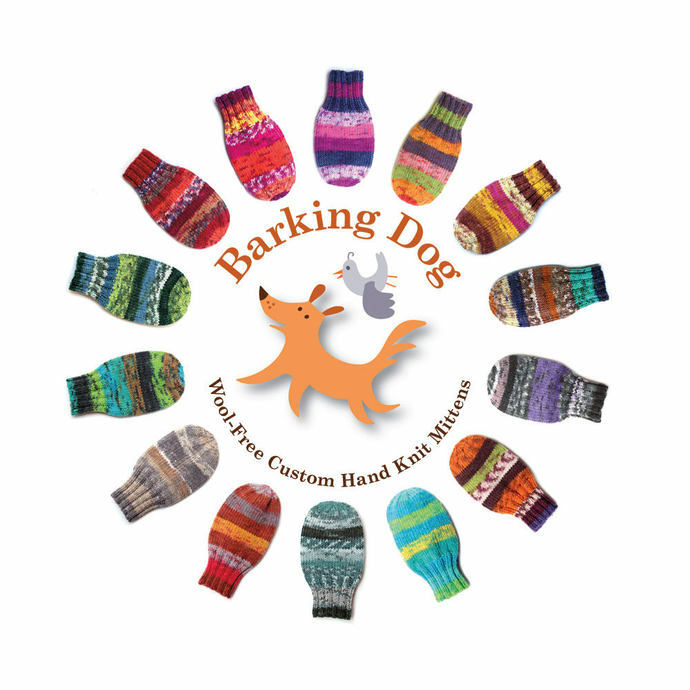 Corded mittens are joined with a knitted tubular coat cord to prevent them from being lost. This knitted tube of fabric is stronger than the simple crocheted chain that is typically seen. To use the cord, simply slip each mitten through a jacket sleeve and secure the cord with the provided safety pin to the inside back neck of the jacket to hold it in place. 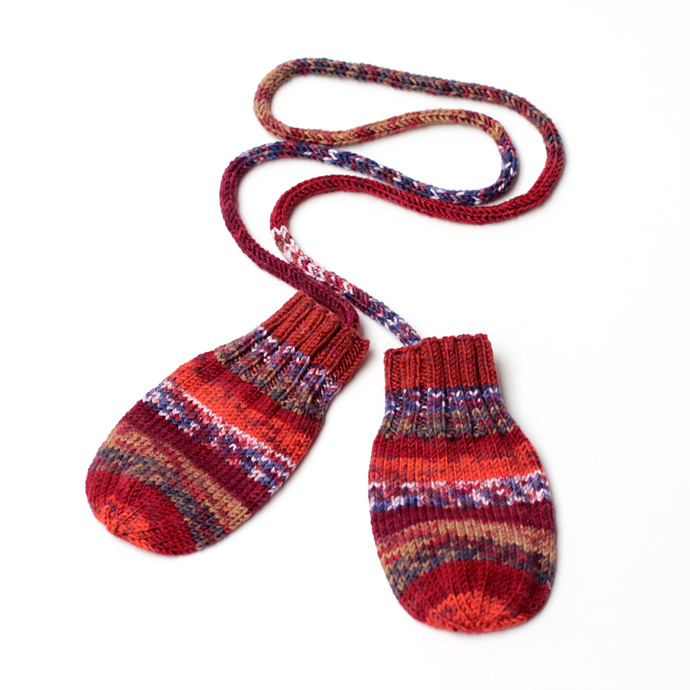 Use a tailor's (cloth or vinyl) tape measure to determine the mitten size. 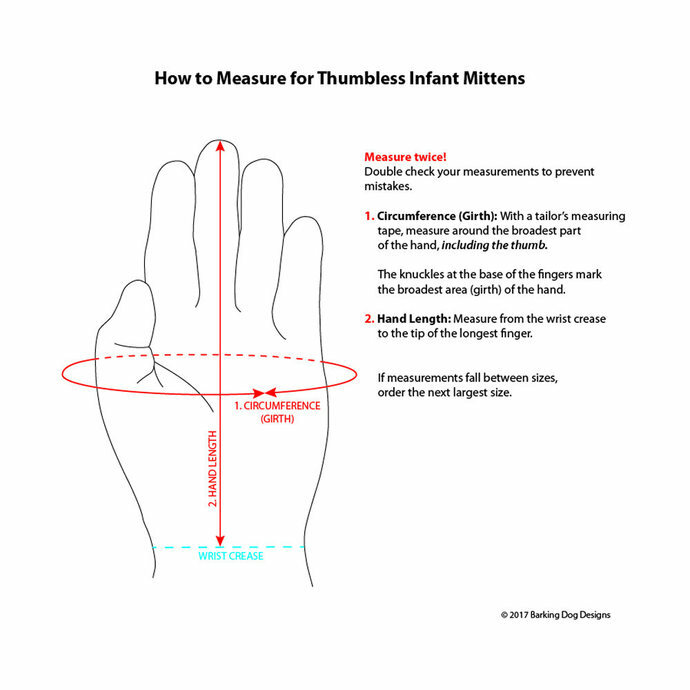 To ensure a good fit, refer to the illustration in photo four, "How to Measure for Thumbless Mittens," for measuring instructions. Double-check your measurements to prevent mistakes. Use the table below to select the right size mitts for your baby. Please keep in mind that each child is different when it comes to sizing. Age and body weight only partially determines size. Compare your child's hand measurements to those listed below. If the baby's hand length falls between sizes, order the next larger size. FIBER CONTENT/CARE INSTRUCTIONS: Top quality, long-wearing, four-ply yarn (imported from Turkey) is a blend of 93% acrylic and 7% PBT (a type of polyester). Hand wash in cold water. Reshape and lay flat to air dry. May be machine washed and dried. Secure corded mittens in a mesh bag to prevent tangling in the washer.